Volcanic eruptions have been known to cool the global climate, but they can also exacerbate the melting of ice sheets, according to a paper published today in Nature Communications. Researchers who analyzed ice cores and meltwater deposits found that ancient eruptions caused immediate and significant melting of the ice sheet that covered much of northern Europe at the end of the last ice age, some 12,000 to 13,000 years ago. "Over a time span of 1,000 years, we found that volcanic eruptions generally correspond with enhanced ice sheet melting within a year or so," says lead author Francesco Muschitiello, who completed the research as a postdoctoral fellow at Columbia University's Lamont-Doherty Earth Observatory. These weren't volcanoes erupting on or near the ice sheet, but located a thousand miles away in some cases. The eruptions heaved huge clouds of ash into the sky, and when the ash fell on the ice sheet, its darker color made the ice absorb more solar heat than usual. 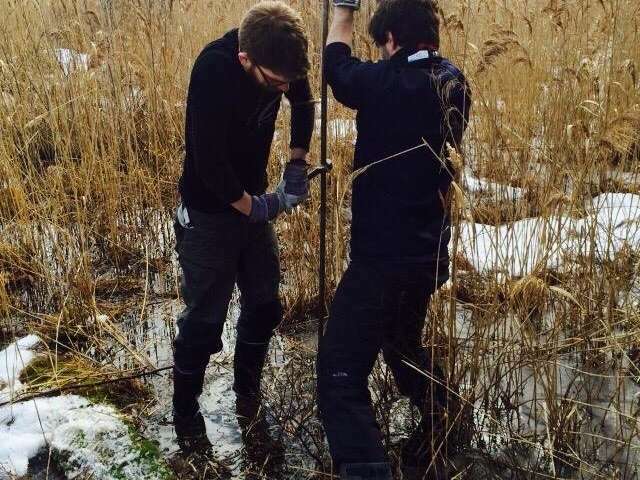 "We know that if you have darker ice, you decrease the reflectance and it melts more quickly. It's basic science," says Muschitiello. "But no one so far has been able to demonstrate this direct link between volcanism and ice melting when it comes to ancient climates." The discovery comes from the cross-sections of deposits, called glacial varves, most of which had been collected in the 1980s and 1990s. Varves are the layered sediments that form when meltwater below an ice sheet routes large amounts of debris into lakes near the sheet's edge. 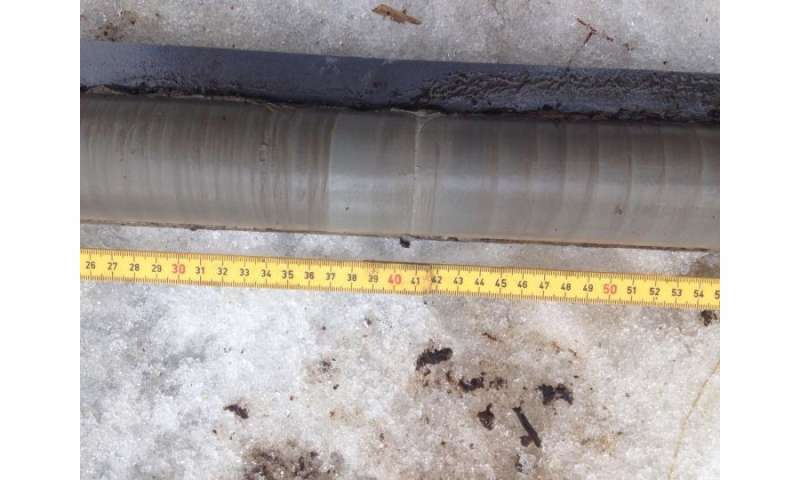 Like the rings of a tree, the layers of a glacial varve tell the story of each year's conditions; a thicker layer indicates more melting, since there would have been a higher volume of water to carry the sediment. The team also compared the varves to cores from the Greenland ice sheet, whose layers contain a record of ancient atmospheric conditions. Testing of those layers for sulfates revealed which years experienced explosive volcanic eruptions, which tend to release large amounts of ash. Matching up the ice layers with varve layers from the same time periods, the team found that years with explosive volcanic activity corresponded to thicker varve layers, indicating more melting of the northern European ice sheet. Muschitiello and his colleagues studied a period ranging from 13,200 to 12,000 years ago, when the last ice age was transitioning into today's warm climate. They focused specifically on volcanic eruptions in the northern high latitudes—events similar to the 2010 eruptions of Iceland's Eyjafjallajökull volcano. Although that eruption was relatively minor, its large ash cloud shut down air traffic across most of Europe for about a week. How much melting could an eruption like that cause? "It's difficult to put an exact number to it," says glaciologist and coauthor James Lea from the University of Liverpool. "It depends on many factors." Running thousands of model simulations, the team found that the amount of melting depends on the individual eruption, which season it occurs in, the snowpack conditions at the time, and the elevation of the ice sheet. "Change any one of these and you would get different amounts of melt," says Lea. In the worst scenarios, the model predicted that ash deposition would remove between 20 centimeters and almost one meter of ice from the surface of the highest parts of the ice sheet. The model results should be taken with a pinch of salt, Muschitiello cautions, due to uncertainties about past conditions. However, because the team simulated a very broad range of potential conditions, he's confident that the ice sheet's real response lies somewhere within their range. Michael Sigl, a paleoclimatologist from the Paul Scherrer Institute in Switzerland who wasn't involved in the new study, says the hypothesis that ash particles might counteract the cooling effects of volcanic eruptions is intriguing. But, he said, "coincidences in the timing of rapid ice-sheet melting events and eruption dates do not automatically imply causation, and there may be other scenarios that could be consistent with the presented data." Sigl's own work has found a link between eruption-induced ozone depletion and deglaciation in the Southern Hemisphere. Nevertheless, he says, the new study shows that more work is needed to understand the effects of aerosol emissions from volcanic eruptions. The preliminary results suggest that "present day ice sheets are potentially very vulnerable to volcanic eruptions," says Muschitiello. They also point to a possible hole in the climate models that scientists use to make predictions about the future: Models currently don't simulate the ice sheets' response to changes in particulate deposition from the atmosphere in an interactive way. Another intriguing implication is that previous research has suggested that melting ice sheets and glaciers could increase the frequency of volcanic eruptions in glaciated areas by lightening loads on earth's crust, allowing underlying magma to rise. If the link between volcanism and ice sheet melting is confirmed, it could indicate the presence of a so-called "positive feedback loop" in which eruptions exacerbate melting, and more melting causes more eruptions, and so on. Muschitiello says the study "can give us hints about the mechanisms at play when you're expecting rapid climate change." This mechanism was also explored in my paper on the ice ages. The achilles heel of an ice age world is its albedo. If the ice can be darkened, insolation absorption can increase by hundreds of w/m2, when measured regionally. And every interglacial is preceded by 10,000 years of dust storms. Now all we need is a regulating factor for dust. The dust over Greeeland prior to the interglacial was from the Gobi desert, and the regulating mechanism for Gobi dust is provided by CO2. When CO2 reaches a nadir during the glacial maximum, high elevation plant life on the Gobi plateau is asphyxiated, forming new CO2 deserts, which create dust. So CO2 causes global warming through the agency of eliminating high altitude plant life. It is an elegant that explains every facet of ice age modulation. 'Modulation of ice ages via precession and dust-albedo feedbacks'.